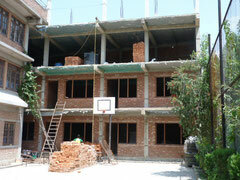 School Extension Phase 2 - SAHAYA Nepal e.V. Webseite! Just 2 years after start of the project the building skeleton is already complete! The photos shows the status August 2015. All furniture, windows and doors will be made by local craftsmen. Donate for this ambitious project!